Aviatech Flight Academy recently celebrated their eighth awards evening since opening for operation in February 2010. 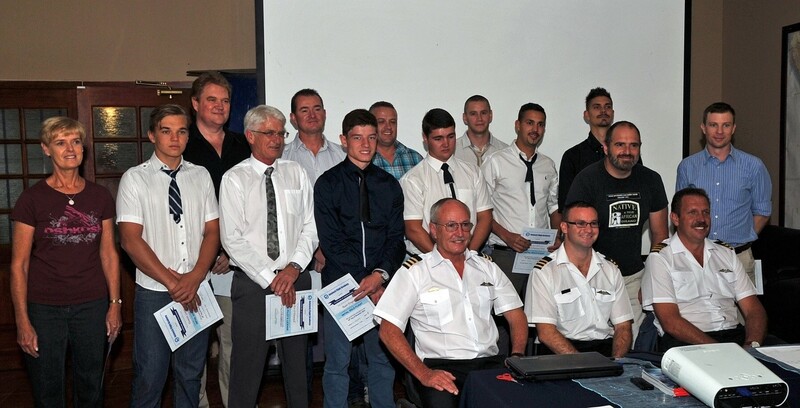 The evening proceeded by honoring eight initial solo students and seven Private Pilot graduates during a formal presentation of certificates and wings. This was followed by much socializing and networking between the pilots, families and friends at the ensuing meal and refreshments. In all approximately 80 people attended and enjoyed the function. Candidates have the added benefit of becoming part of a broad aviation based community where much is learnt at group safety meetings and by general ‘hangar talk’ frequently lacking at many other facilities but is vital to the development of well trained aircrew. From left to right: back row, Wikus Kruger-wings, Charlie Gradidge –wings, Shaun Kruger-wings, Michael Martin-solo, Middle row: Adrienne Saunders-wings, Duncan Louw-solo, Pat O’Donnell-wings, Ruan Kruger-solo, Hennie Moulder-solo, Rory De Pentheny O’Kelly-solo, Sean De Pentheny o’Kelly-solo, Cladio Buffa Pace-wings, Douglas Bradley-wings, Front row: Chris Kyle-instructor, Gavin Bennetts-instructor, Nico Smith-instructor . As seen in photo above the traditional ‘tie cutting’ was executed for the soloists. Copyright © 2019 Aviatech Flight Academy All Rights Reserved.